The popular period sleuth series Detective K is set to return next year with its third installment, currently entitled Detective K 3. Stars KIM Myung-min and OH Dal-su and director KIM Sok-yun will all return while TV name KIM Ji-won will mark her first period film appearance with the project. 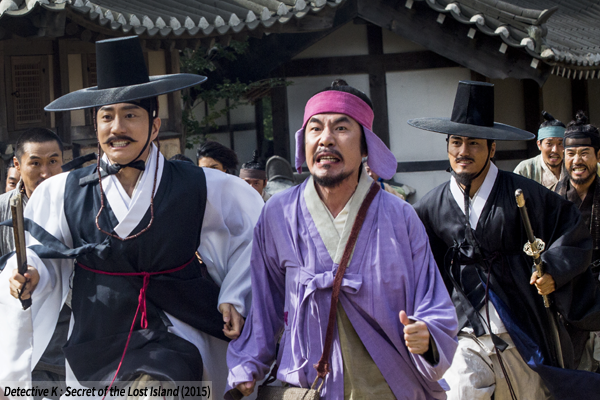 In 18th century Joseon, during the reign of King Jeongjo, Detective KIM Min and his sidekick Seo-pil tackle a new case involving a string of murders targeting readers of popular novels by a particular writer. The story is based on the 2003 novel Bangkakgon Murder Incident by writer KIM Tak-hwan, whose 2007 work Secret of Virtuous Widow was adapted into the first film. Outside of the Detective K series, KIM Myung-min is known for films such as Deranged (2012), Pandora (2016) and most recently A Day. OH Dal-su is the top character actor in the business, having starred in several of the highest grossing Korean films of all time, including The Thieves (2012), Ode to My Father (2014) and Veteran (2015). KIM Ji-won has appeared in Descendants of the Sun as well as other hit shows. On the big screen, she has featured in JANG Jin’s Romantic Heaven (2011) and the first two Horror Stories anthologies. Quick (2011) and Spellbound (2011) star LEE Min-ki is also on board for a special appearance. Released during the Lunar New Year holiday in 2011, the first Detective K, Secret of Virtuous Widow, became a major hit, recording 4.79 million admissions (USD 31.25 million). In 2015, the sequel Secret of the Lost Island scored again, wooing 3.87 million viewers (USD 26.57 million). Distributor Showbox will deliver the film next year, once again during the Lunar New Year holiday in February. Shooting kicks off in August.